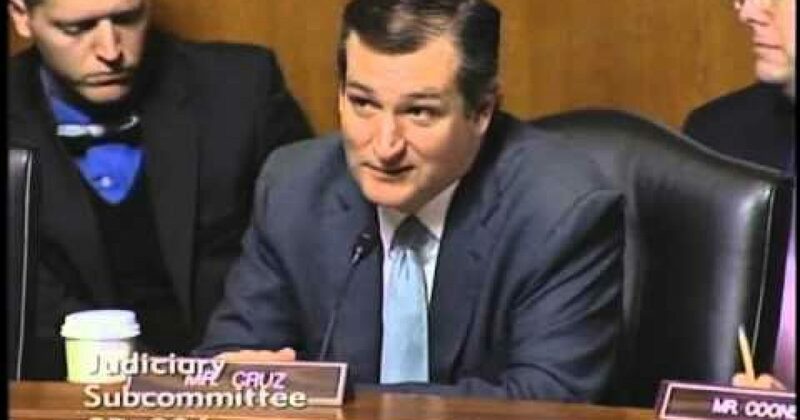 It was nothing short of brilliant Sen. Ted Cruz (R-Texas) spoke with Sierra Club president Aaron Mair during a Senate Judiciary subcommittee hearing yesterday in an exchange proving that the climate change enthusiasts simply don’t want to listen to the facts. So Cruz tried shifting tactics and asked if the data proved he was wrong would he retract his testimony that climate change is real and like a robot, the President of The Sierra Club would lean back listen to his people and say he agrees with the 97%…yadda, yadda, yadda. It was a classic exchange and the video is embedded below. At one point in the exchange Sen. Cruz mentioned that the study, which concluded that 97% of scientists agreed with the climate change hypothesis, was bogus. He was totally correct. The results of the study which declared the near unanimity was totally misrepresented by the study’s author and the media. The study reporting the 97% consensus “Quantifying the consensus on anthropogenic global warming in the scientific literature” by John Cook, and friends under the halo of the University of Queensland was published in 2013 and according to Watts Up With That when the source data for the study was published on line the University of Queensland got so worried, they threatened a lawsuit over use of Cook’s ’97% consensus’ data for a scientific rebuttal. Popular Tech. looked into precisely which papers were classified within Cook’s asserted 97 percent. The investigative journalists found Cook and his colleagues strikingly classified papers by such prominent, vigorous skeptics as Willie Soon, Craig Idso, Nicola Scafetta, Nir Shaviv, Nils-Axel Morner and Alan Carlin as supporting the 97-percent consensus. A more extensive examination of the Cook study by the New American, reported that out of the nearly 12,000 scientific papers Cook’s team evaluated, only 65 endorsed Cook’s alarmist position. That is less than 0.97%. The crucial point here is the qualifying clause, “of those who have an opinion.” In other words, even the highly questionable Cook study doesn’t actually claim, as President Obama does, that “Ninety-seven percent of scientists agree.” In fact, when examined closely, one finds that the study says only one-third of the authors of the published research papers they examined expressed an opinion that the Cook team interpreted as either an implicit or explicit endorsement of AGW. So now its 97 percent of one-third of selected scientists in a sampling of research papers. That’s a far cry from the 97 percent of all scientists claimed by President Obama and many of the media stories. And, as we will show below, even this admitted dramatically lower consensus claimed by the study is fraught with problems and falls apart further under examination. Another criticism of the Cook and buddies paper is they didn’t define the “consensus” they were looking for. Is the 97% for people who believe the global warming is real, or people who believe its real and caused by mankind. From the data and methodology Cook has allowed the public to see, the 97% consensus figure is totally bogus, and the fact he preventing full disclosure of his data, via University of Queensland, by threatening legal action suggests there may be more nefarious things being withheld. The bottom line is that Senator Cruz was correct and Sierra Club president Aaron Mair was full of baloney (or at least the people sitting behind him feeding him answers). And for their baloney they get the worst rating on our global warming liar scale…four ugly Christmas sweaters (because some scientists say we are going to have a mini ice age soon and they will need to keep warm).